This is my tribute to Rachel Flowers, the “Californian Wonder”. I want to congratulate her for all the efforts she has been making all over the years -presently she is 17 years old and she will be 18 by the end of 2011- to achieve one of her dreams: to win the Ventura Music Festival Jazz Student Competition 2011. This gave her the opportunity to play with the famous trumpeter Arturo Sandoval in a concert on 12th February 2011. Rachel is a musical prodigy, but there is also a lot of hard work and dedication to music behind every performance of hers (not to forget the tremendous efforts by her mother Jeanie Flowers and little brother Vaughan). True, she has a gift for music, but she is a hard worker as well and, what I call, a “WWME”, that is, a “Walking World Music Encycopledia”. Hammond C3 and L100 Organs, different flutes, many pianos, Moogs, drums, bagpipes, some Nords. 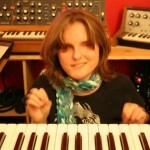 Victorious multi-instrumentalist Rachel Flowers has a promising and brilliant career ahead! If you wish so, you can also follow Rachel Flowers on Facebook and Twitter.